Poori and potato masala (potato masala curry) go hand in hand. In most of the restaurants, puri is usually served with poori masala. 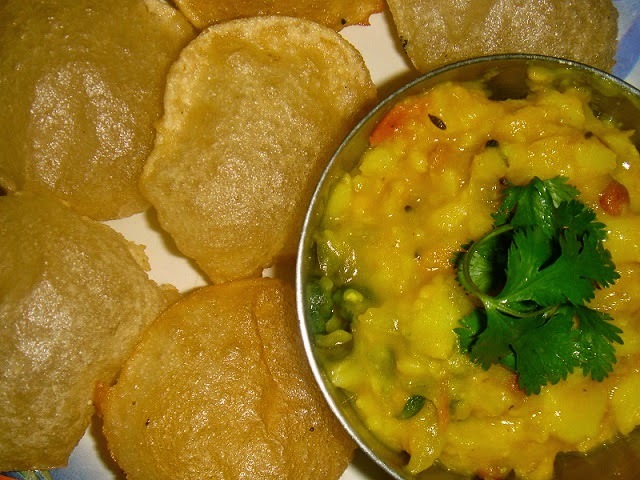 It is a fantastic combination for poori. This potato/aloo bhaji goes well with chapati also.Today we will learn how to make poori masala following this easy recipe with step wise pictures. I am also sharing with you tips and tricks to make a good potato masala. Wash and pressure cook potatoes for 3 whistles or until soft. After it cools, peel the skin and mash it up well. (but not to a paste) Keep it aside. Thinly slice onions, chop tomatoes and keep it ready. Heat oil in a pan/kadai, add mustard seeds, when it splutters, add channa dal and urad dal. When dal turns golden brown, add onion, green chillies and curry leaves. Once the tomatoes are cooked, add 1 3/4 - 2 cups of water and salt needed.You can check for salt now by tasting the water. It should be slightly salty. Once we add potatoes, it will be perfect. Let the water boil. Then only you should add the mashed potatoes. If you add potatoes before adding water, the whole thing will become a mass when it cools. So the trick is to add water first and then add mashed potatoes to the boiling water. After adding the potatoes, keep it in medium flame and cook for another 3-4 minutes. Switch off the stove and garnish with finely chopped coriander leaves. Serve with hot pooris. It will take your taste buds on a trip to heaven!! This aloo/potato masala can also be had as a side dish for chapati, stuffing for bread toast or sandwich.